EA Sports have released even more FIFA 19 Ultimate Team ratings ahead of the game's release on September 28 for PlayStation 4, Xbox One, PC and Nintendo Switch. Today, we have been shown players 21-30 out of the top 100 players in the game. As we get closer to the game's best players, the final ratings are becoming increasingly exciting as well as controversial. Mohammed Salah had a spectacular season for Liverpool, leading to him being named in the final three for Best Fifa's Men's Player award alongside Real Madrid duo Cristiano Ronaldo and Luka Modric. Despite that, EA have comparatively ranked him quite low. The Egypt international has boosted up to an 88 overall after originally being an 83 in FIFA 18. The impressive is stacked with amazing stats including 92 pace, 89 dribbling and 84 shooting. Whilst a very strong card, it seems strange of EA to rank another 26 players ahead of him. Especially certain players like Isco who didn't reach the same heights last season. While Isco may have proved his quality at the World Cup and during Spain's friendly with England this last weekend, he struggled at times for Real Madrid. Despite that, EA have given him an 89 overall with 72 pace, 92 dribbling, 81 shooting and 85 passing. Another player who is surprisingly above Salah is Manchester City's David Silva. The Spanish midfielder helped City to a dominant season in the Premier League but by no means did he have as big an impact as Salah. His 89-rated card looks useful with 66 pace, 91 dribbling, 74 shooting and 87 passing. Finally there is Juventus' Paulo Dybala who will turn out to be an incredible attacking threat both in-game and real life alongside Cristiano Ronaldo at Juventus. The ridiculous 89-rated card has 85 pace, 91 dribbling, 85 shooting and 84 passing. EA Sports have released another batch of FIFA 19 Ultimate Team ratings ahead of the game's release on September 28 for PlayStation 4, Xbox One, PC and Nintendo Switch. This time we have numbers 20-11 so we can see who just missed out on the prestigious top 10. We've finally been given our first glimpse of players rated 90 and above but there's a few high profile players who didn't quite reach that landmark. 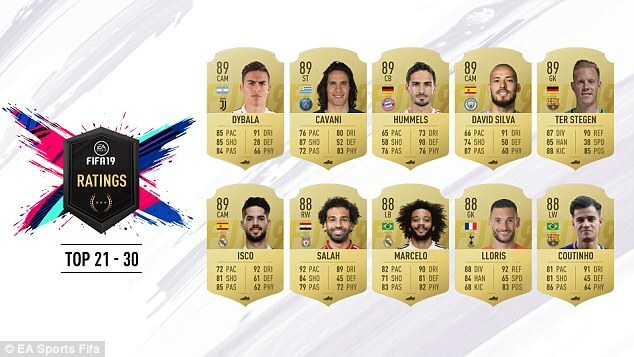 That includes Tottenham's Harry Kane, Manchester City's Sergio Aguero and and Atletico Madrid's Antoine Griezmann who all have an overall of 89 in FIFA 19. 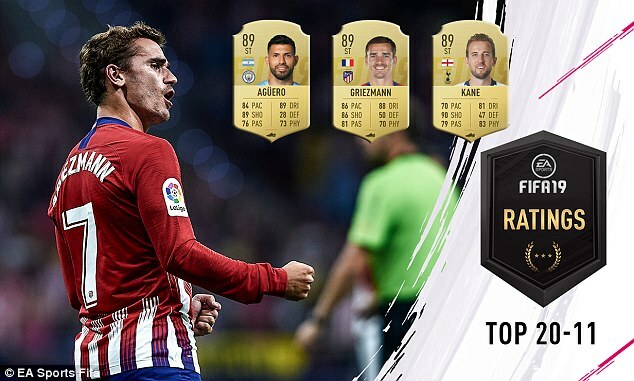 While Diego Simeone reckons Griezmann has been the best player in the world over the last year, EA are on a different page - leaving him out of the 90 ratings. They still upgraded him by one though and his card looks lethal with 86 pace, 88 dribbling, 86 shooting and 81 passing. Kane just missed out on the Premier League Golden Boot last year to Mohammed Salah but he has beaten the Egyptian's FIFA rating of 88. After a strong season which included the World Cup Golden Boot, Kane has been upgraded from his 86 rating in FIFA 18. The impressive card sports 70 pace, 81 dribbling, 90 shooting, 79 passing and 83 physicality. Meanwhile Aguero's overall has stayed the same from last year, although his pace has been downgraded. He now has 84 pace as well s 89 dribbling, 89 shooting, 76 passing and 73 physicality. 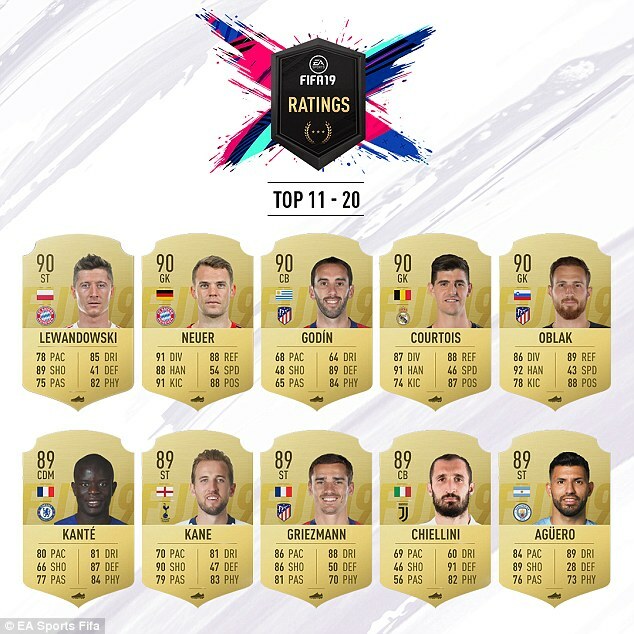 Chelsea's N'golo Kante makes sure the top 20 players list is even more stacked with an upgrade from 87 to 89. The World Cup winner now has 80 pace, 81 dribbling, 66 shooting, 87 defending, 77 passing and 84 physicality. As for the 90 ratings, three goalkeepers have been included by EA - Thibaut Courtois, Jan Oblak and Manuel Neuer. Courtois has been given a small upgrade of one after joining Real Madrid while Neuer has been downgraded by two following his injury problems. The best 10 players on FIFA19 finally revealed with Kevin de Bruyne and Eden Hazard leading the way for Premier League stars… but who comes out on top between Lionel Messi and Cristiano Ronaldo? * Once again, Lionel Messi and Cristiano Ronaldo are top two... but who is first? 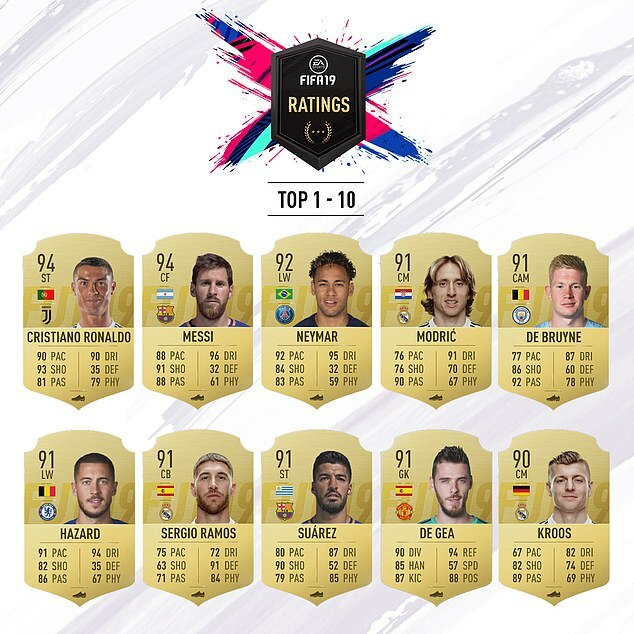 EA Sports have finally put FIFA fans out of their misery and named the top 10 players on the latest version of the game. After a week involving an excruciating countdown of the top 100 stars, the cream of the crop have finally emerged, with a number of familiar faces. In fact, the three top players are exactly the same as last year, with Neymar rated the third best player on the game, behind former team-mate Leo Messi and cover star Cristiano Ronaldo top of the pile. Behind them, Luka Modric, who helped Real Madrid to the Champions League and led Croatia to the World Cup final this summer, is recognised as one of the top stars with his fourth place, while Kevin De Bruyne is the top-rated Premier League star. Eden Hazard sits just behind his top-flight rival in sixth, while Sergio Ramos is the best rated defender on the game. Luis Suarez, who was fourth last season, drops down to eighth, while David De Gea is the top-rated keeper - the Manchester United shot-stopper rated ninth overall. Toni Kroos rounds up the top 10, and is the third Real Madrid player in the star-studded line-up. While a lot of the players have been awarded the same ratings, the players can be distinguished by more specific ratings for certain attributes. Only Robert Lewandowski, Manuel Neuer and Gonzalo Higuain have dropped out and been replaced from the top 10 in last year's game. The newest edition of FIFA will be available to buy and download across multiple platforms from September 28.